On the one side of my village is forest, some is in private ownership, and some is what is known as County Forests. Much of it has been replanted in pine plantation, with pockets of hardwood forest like what is found in My Secret Valley, a 15 minute walk through the pine re-plantation, and there are also some fields that are regenerating themselves with trees, seeding themselves from the nearby forests. 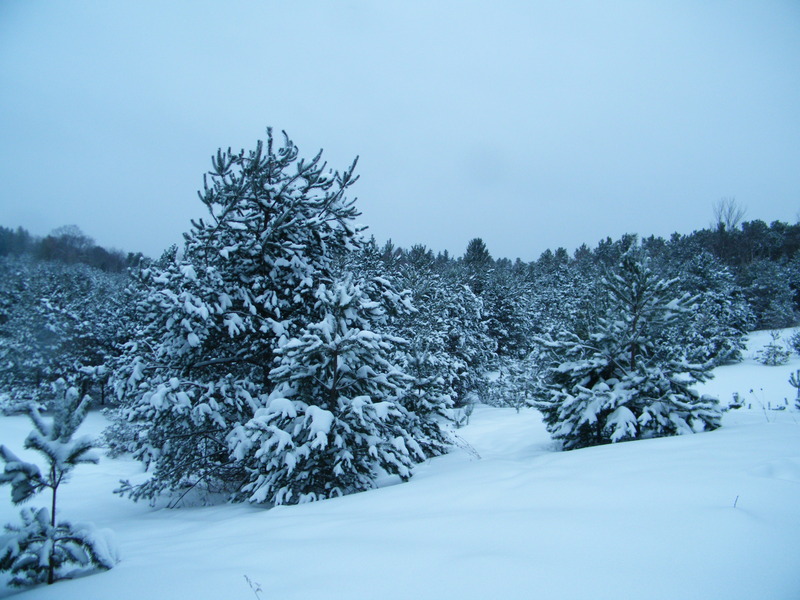 Snow covered pines, self seeded from nearby pine forests. I love the stillness in the forests in the winter, but even then, nature provides it’s own sounds unique to winter. 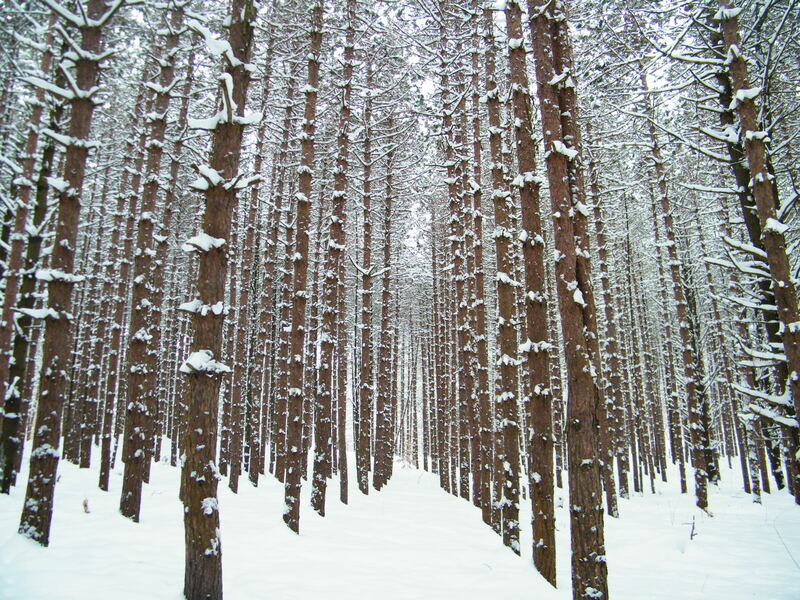 When it is very cold, particularly in the hardwood forests, the branches will crack and pop. Then there is the younger beech nut trees. 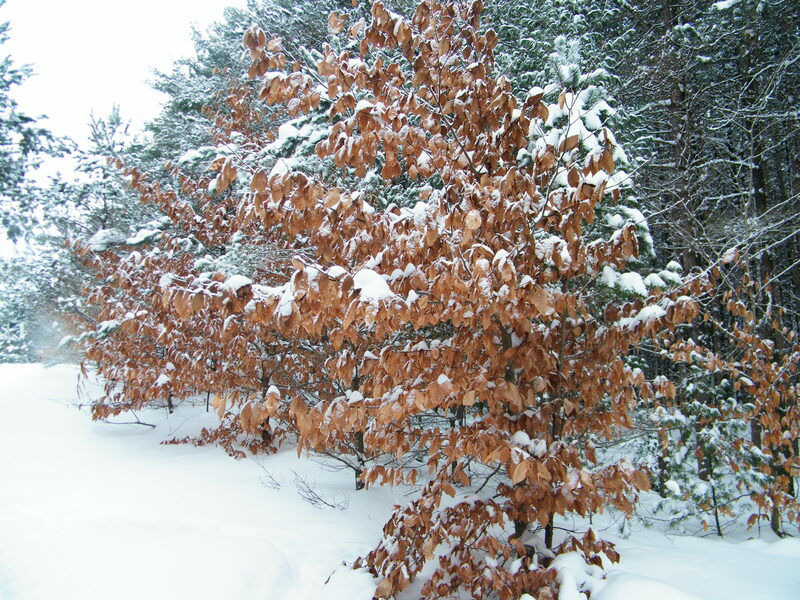 The mature trees completely lose their leaves in the fall, just like any deciduous tree, but younger beech nut trees, for some reason hang onto their dead leaves. Only in spring when new buds burst forth, do the old leaves fall off. But even in the slightest breeze, the old dead leaves makes the most beautiful rustling sound. I love it! Always interesting how a person might miss seeing something hiking in, but might only notice it coming out. Such as this log. 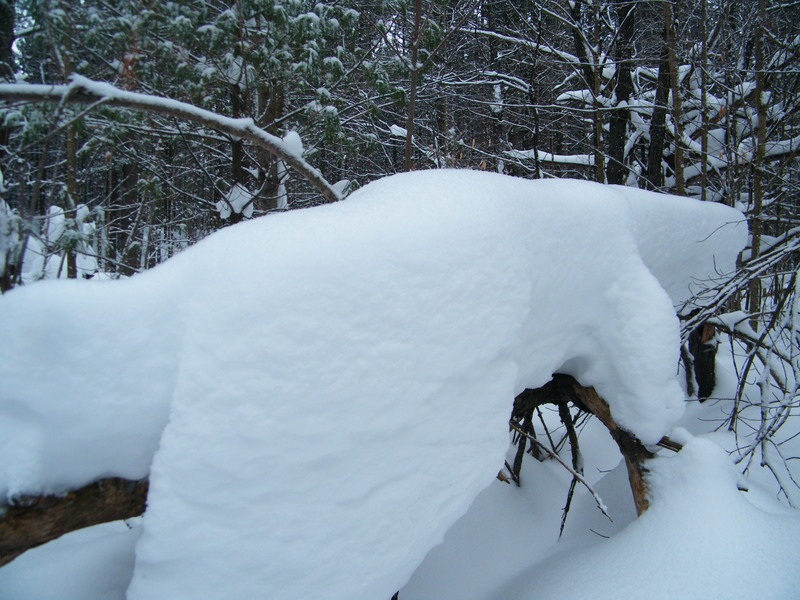 Just a simple, fallen log, but the snow has a way of transforming it. I would happily go out photographing in the snow… If we had some!! You really are lucky! We used to have sniw with more regularity when I was younger but I feel for my kids… It happens rarely here for us in any child pleasing volume! This is the whole global warming issue basically, isn’t it! Though in a relatively small country, like England, the weather variation from North to South is pretty vast! We live in the south east and my town is known as the ‘Hot Spot’ of England… But a village away they can be snowed in, due to drifts, where we get a smattering, and it disappears within a few hours! Great pictures by the way! It is hard to describe that unique sound of the tree branches, but I think you hit it right on the head, “hollow sound that a forest makes”. It looks amazing. I have never seen anything like that before in person. Wow. 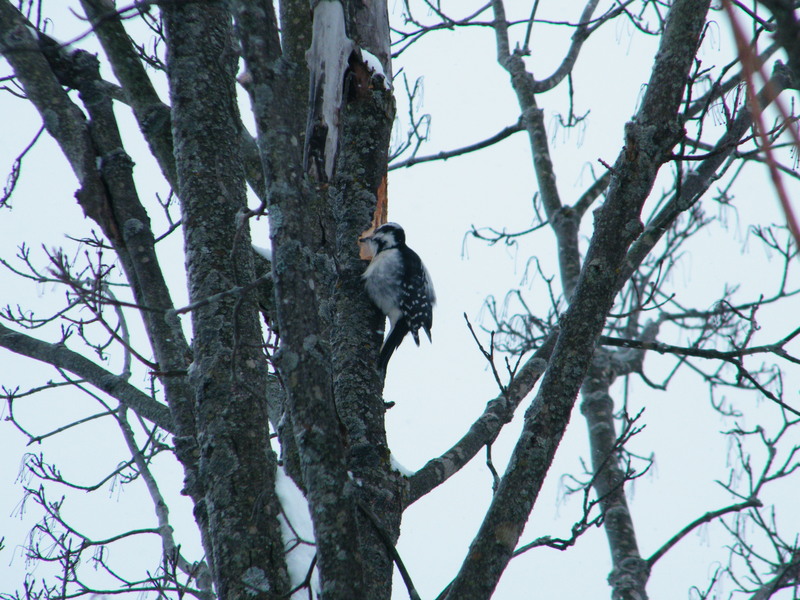 I think the Downy is the smallest native woodpecker. This would be a female in the picture. The male has a small splotch of red on the top of the head. Beautiful….the beauty of nature speaks by itself…and you catch it so nicely! Well done! This is so cool! I have always wanted to live somewhere it snows.. Someday it might actually happen 🙂 thanks Carl – the pics are beautiful. I asked for a virtual winter wonderland tour, and my awesome friend Carl at The Old Fellow Goes Running came through in stellar fashion! Looking at these photos and reading Carl’s commentary transported me to a place I dearly miss! It was my absolute pleasure Karen. And thank you for taking your friends and followers along for the tour with your kind reblog. It was a great outing. Carl, this is a lovely follow-up post to “Groundhog Day”. Your photos are amazing, still looking awfully cold! All very interesting, and so much snow! I like how you described “the hardwood forests” very intriguing, especially “the younger beech nut trees” holding on to their old dead leaves, I’m sure it’s absolutely magical to hear them rustle in the breeze. Thank you for a personal glimpse into your beautiful snowy world. Please take good care and stay warm! 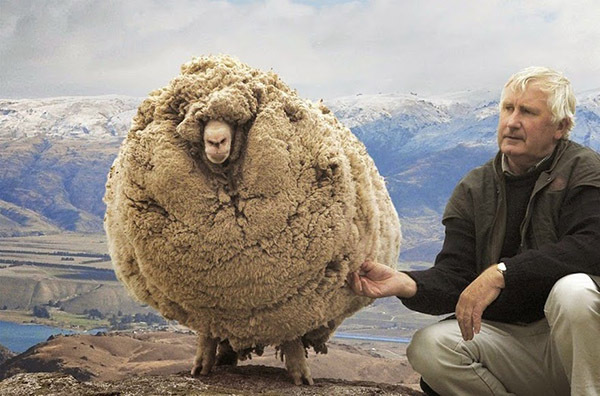 Aww Pepperanne, thanks so much for coming along for the hike. Hope you were not too cold. You definitely have to bundle up, but once you keep moving, you do keep yourself warm. Thanks again for stopping by. You always leave such a wonderful, personal comment that makes my day! You are very welcome! My pleasure. Beautiful photographs! These reminded me of my childhood in Anchorage, Alaska! Thank you so much Rachael Ann. What an incredible childhood it must have been growing up in Anchorage. Now THAT is what would be winter, with of course the days being so much shorter than what we have here in Canada. Thank you for the snow pictures! I don’t get to experience much snow now or cold, cold winters. My parents live in the English countryside with amazing winter views and there are times I miss the cold and the winter light. I can completely understand where Karen is coming from as time to time I catch myself staring dreamily at snow covered forests, the Northern lights, imagining the sound of silence and crunching snow! Thank you so much for dropping by Natalie. I think if a person has experienced winters and snow, and spends seasons away from it, they REALLY do miss the snow. Oh, I loved this Carl. I always have loved looking at the snow. Especially beautiful pictures like this with it full on the trees. Wonderful post! I felt just like I was walking with you. I loved the little birds. Now, I do want some hot chocolate, though. I will imagine I am having some with you ❤ Have a great day, my friend. Thank you for coming, walking with me, and experiencing the snow on the trees and the birds. Did you get enough hot chocolate? Oh no, my lovely Prajakta. I am so sorry this has made you jealous. Hopefully somehow, somewhere, we can get you to a place where you can experience snow. Out of curiosity, how close are you to the Himalayas? I am thinking that might be the closest place for you to experience snow, but probably is a long distance. It is interesting, some people in Canada, sometimes think too much snow, when it snows often, because we have to shovel it and drive through it. We forget that people like yourself would give anything, just to experience it. I really love walking in the snow, particularly in the woods. Himalayas are actually the only place I have experienced snow – even spent a night during a light snowfall 🙂 Very far the mighty mountains are but make every moment count! Maybe one day, I wlll make a trip in snowy woods in Canada 🙂 Waiting! The word “normalcy” was the exact word I was thinking of Prajakta. And yes, experienced the desert once in Death Valley in the United States….loved it so much. Those in Death Valley were dreaming of snowy climates. Carl, I LOVVVVVEEEE this post!!!! I grew up in Iowa and lived there again as an adult and there really is something magical about the snow, especially running in it. It’s that cold for six months thing that got to me! Great post and thanks for sharing!!!! Thank you so much Kelli. You definitely would experience lots of cold weather in Iowa. I live in the lee of the Great Lakes, Until they freeze over, they do moderate the temperature somewhat, and also means lots of snow. All the best in your upcoming marathon! For someone who has only seen snow once in my life, this was a lovely walk through the woods and snow!! Beth, I have missed you! Thank you so much for dropping by for the walk in the woods and snow. So glad you enjoyed it. I loved the photos! They are really great. I love looking at the beautiful snow without feeling the cold 🙂 You should do “picture posts” more often! Thank you so much Lilka, I really appreciate this, glad you kept warm! 🙂 Think I will do these type of posts more often. Thank you so much for your encouragement! 🙂 I quite enjoyed taking pictures while going for my walk. Totally jealous… would love some of that snow here in Northern California. Thank you so much Walter. I am thinking Northern California normally gets snow, and it really would be missed if it is in short supply this winter. Wish I could send some your way! Just stopped over Adi. Thank you so much for nominating me with this award. Wow, it would not take long for all this snow to melt if it were 100 degrees. Thank you Carole for stopping by, and your comment. I can’t say that I am a fan of snow Carl, but it certainly has a way of transforming places with such beauty. Thank you for showing me around on your traipse through the snowy wood. Snow certainly does transform. We have actually gotten more snow since these pictures. Please keep safe with the cyclones in Australia my friend. Beautiful photos, Carl! You are fortunate to live so close to such a beautiful forest. I had to plant some pine trees (redwoods–not the big kind) in my yard. I’m about a 30 minute drive west of the Sierra Nevada foothills. Back in 1985 (this sort of dates me….LOL) a friend and myself drove up into King’s Canyon Park, where they have those giant sequoia’s. (saw General Sherman) Such a humbling experience when you witness in person the magnificence of these trees. Good for you to do a photo post. Why not these are lovely images .I especially like the reforestation photo. Quite the straight rows and makes for a lovely effect! Thank you Carl! What a generous thing for you to say. I have had lots of encouragement from other bloggers and I am delighted to pass on the same. Wishing you a great evening! Thank you Diana for stopping by to read and comment. Really appreciate you sharing this, have so much respect for you. You’ve been the sweetest, Carl. Happy Easter to you and yours. I just love winter woods photos, as we don’t have snow here on Guam. So my fav state to drive through is Oregon. Thank you so much for stopping by, and for your wonderful comment. Wow…Guam. That is amazing! these are awesome pictures Carl. Winter in your village is beautiful. Living in Hawaii it’s something I have yet to experience 😦 hopefully one day! Jordan, thank you so much for stopping by. It will just be about another month until winter will set in. We have had a light dusting of snow a week ago, and it is now melted. must be beautiful watching the seasons change. Yes! I’m actually from the big island and most people don’t realize it snows here! Wow, I did not realize it is the Big Island you are from. It would be so fascinating with the lava flows as well as the volcanos that do get some snow. Great photos, Canada is such a fantastic country! Yeah, I do love Canada Sharon. There are so many beautiful places in the world. I have yet to visit Europe. The French alps where you live must also be SO beautiful. If you are used to snow this would be a huge adjustment. I had 1 winter without snow way back in 1988 when I married in New Zealand, It was their summer and it was so strange walking around in shorts. There is something truly magical about the snow!